Sugar-Free September | You don't need sugar to be sweet. As great as it is to have a balanced diet, it’s also vital to incorporate exercise into your daily routine to aid in quick results and to benefit your health overall! 16. Colour your plate. The more green the better. 18. 2 fruit, 5 veg. 19. Enrich your diet with fiber. 20. Plank. Incorporate leg lifts. Day 12? Only day 12?! Are you kidding! ….So I guess you could say that I am a bit of a sugar addict, probably more so a chocolate lover. It’s been 12 days and it feels like I am crawling on hands and knees down Struggle Street. The first week was quite easy because there was barely any junk food in the house, so the cravings were ignored out of laziness of not wanting to walk to the shops. However, after recently catching tonsilitis, my family have been visiting and delivering some sugary gifts to assist the mending process. Don’t worry, I’ve been good and haven’t touched them…yet. They are at the top of my cupboard, sitting there, staring at me. A packet of Tim Tams and a block of Cadbury chocolate. I’m sure in the medieval days this was definitely a form of torture. I was unsure whether or not to post this, but I went ahead so others could relate to my struggle – because this can’t just be happening to me! I was unaware of how much sugar is offered to me on a regular basis, with the most simple example being the cafe’s barista asking if I want sugar in my coffee. This process is definitely all about changing habits. I found that I went from having 1 teaspoon of sugar in my coffee, to half a teaspoon of honey, to none at all. It still doesn’t taste quite the same, but knowing that I’m doing something good for my body makes it bearable. Trust me, if I can do this, anyone can do this! I’m fairly sure there have been times in my life where my body was pumping more sugar through my veins than blood! Hang in there, and if you feel a need to have something sugary, drink some water and go for a walk. Fresh air is the best kind of medicine. Now, we’ve all heard that people can either be salad lovers or haters. I believe anyone can be a salad lover, if they customise the ingredients based on their own personal tastes. I’m not saying for those chocolate addicts out there to put a mars bar or two amongst their leafy greens, but salads are quite versatile for the healthy ingredients that can be used. 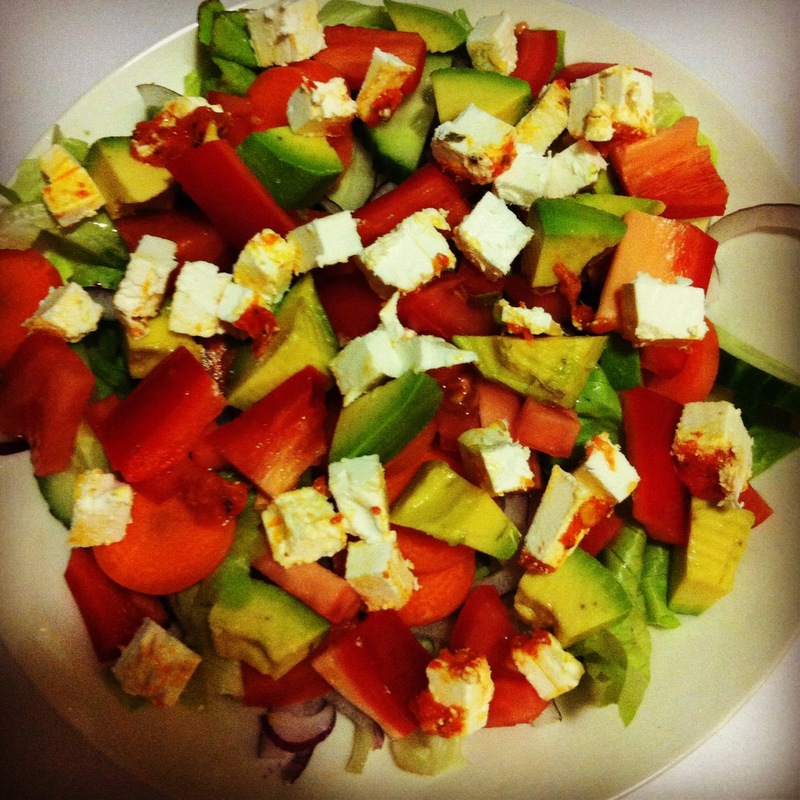 In the salad pictured above I used: capsicum, advocado (yep, I’m an avo addict), carrot, red onion, lettuce and marinated feta. Some other ideas may be: chicken, beans, grapes, cucumber, mushroom, apple, roasted sweet potato, pine nuts, crutons, red cabbage, beetroot…and the list goes on! Not only are salads a great healthy snack, but they are also packed with amazing nutritional benefits – mainly because the vegetables are consumed raw, rather than boiling/frying the goodness out of them. We hope this has inspired you to whip up a quick salad snack and would love to hear of any recipes you may have to share. Top left: Breakfast- organic oats, honey, soy milk, chia seeds, apples, strawberries, blueberries and a handful of Pepita seeds. Top right: Dinner- homemade rissoles with salad (tomato, potato, carrot, avocado, feta, olives, spinach leaves and cucumber. Bottom left: Lunch- homemade dumplings with chicken and herb filling. Super easy and quick to cook! Bottom right: Lunch- Asian style salad with carrot, coriander, lettuce, shallots and raw cashews. Lately, I’ve noticed that stress seems to by the trigger of my sugar cravings. After spending the past two weeks in and out of the house with work and uni, I have come home each night ready for some relax time on the couch with my roommates and a packet of Double Coat Tim Tams. Although somehow, I didn’t think Tim Tam’s made it onto the ‘Acceptable Foods’ list this September. Fortunately, I was able to find a healthier alternative which successfully capped my sweet tooth- natural peanut butter with honey on rye crackers. Firstly, for those who haven’t tasted this sensation before, you are seriously missing out! No honestly, leave the computer right now and head straight for the kitchen. It is life-changing. Honey contains a special antioxidant called flavonoids, which help reduce the risk of some cancers and heart disease. It is also a great natural medicine for coughs and colds (just put 1 tsp in a mug with a squeeze of lemon and some hot water). While many people often perceive peanut butter as an automatic ‘no’ for all diets, there are certain supermarkets which stock products made from 100% peanuts. This is definitely the way you want to go! Natural peanut butter contains amazing immunity-boosting vitamin B6, bone-building magnesium, and muscle-friendly potassium. As for rye, what better way to replace wheat while staying fuller for longer? I have recently found Ryvita crackers at my local supermarket which are amazing (95% wholegrain rye!). Well, that’s all from me tonight. For anyone who hasn’t tried peanut butter and honey before and are doing so for the first time, please let us know your thoughts! We hope you like it as much as we do.